Has high armor piercing, and does higher damage to ships with more armor. Polarizers inflict tremendous damage on enemies with 40 armor or higher. For comparison, base and bonus cap DPS are shown for Fighters (blue) and Bombers (purple). 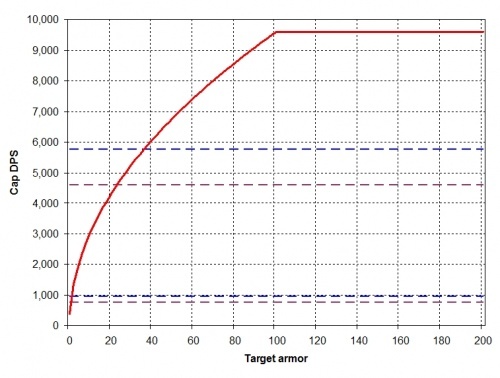 Polarizers are mostly picked for their unique damage ability, as they paradoxically do more damage to armored ships such as Bombers, Raid Starships and Armored Golems. What this may also mean is that they do more damage against the armored ships of higher marks - most mark upgrades come with linearly higher armor as well, increasing the damage boost. It is unknown how this works with Armor damage or Planetary Armor Inhibitors. Not the strongest AI-ship of the pack. With no immunities and short range, it is not difficult to eliminate these before they reach your turrets. An early unlock by the AI gives a strong hint to the player: don't put Hardened Force Fields on the front line.